Okay, well you've had some time to get used to the only kind of transportation available to you at the moment because, as we all know, you're stuck in the 1800s. Even though you've only really watched them on television, the movies or the Internet up until now, here they are all over the place - up close and personal - as they pull carriages, wagons and carts. Yeah, I know you've been thinking of taking a horse-drawn stagecoach somewhere. I'm sure you've been seeing them drop off and pick up passengers in the centre of town. Not sure where you'll end up though. You'd still be in the 19th century, right? What's that? You think you're starting to like horses? You love their big, long-lashed eyes? 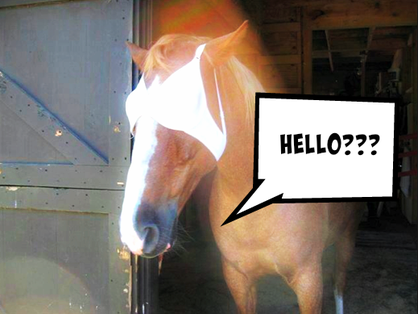 Horses have the largest eyes of any land animal. Usually dark brown, they can also be colours of green, amber or blue. In horses with markings of white, either both eyes or just one can be blue. Is there a horse you especially like? Are you bonding with one? It's said that if you treat a horse with kindness, it will remember you for the rest of its life and will recognize you whenever it sees you again. The life expectancy for a horse is 25 to 30 years. You're trying to get used to its smell? Pee-yew! Well, it's trying to get used to yours, too. Its sense of smell is much better than yours, but not quite as good as a dog's. And don't try sneaking up on this horse. A horse's hearing is good and it can rotate its ears around without moving its head. Go ahead and stroke his forehead or muzzle, though. His sense of touch is well developed. He can feel the slightest touch, even by those of a fly landing anywhere on his body. Why not see if you can locate a riding outfit for yourself - riding habits in Victorian times are well-shaped and not as tight as a regular dress. A riding hat has a turned up brim at the front and comes low upon the forehead. So get out there and do the horsey thing! Just don't fall off this time. By the way, it is only proper to ride a horse side-saddle in the 19th century.